This baffling species has been reported as one of the rarest moonworts in North America (Wagner and Wagner 1993). When Botrychium pallidum (pale moonwort) was listed as endangered in Minnesota in 1996, it had been only recently discovered in the state and was known only from scattered locations in Manitoba, Ontario, Quebec, Saskatchewan, Colorado, Maine, Michigan, and Minnesota. The discovery of this species in Minnesota, and its rapid listing as endangered, stimulated field searches throughout the northern part of the state (Laurentian Mixed Forest Province). As a result, over 100 additional populations were discovered, and they were found in a wide variety of habitats. It has also been found in additional states and Canadian provinces. This new information indicates B. pallidum is not in need of legal protection. Given its vulnerability to habitat encroachment, habitat succession, and invasive species, B. pallidum was retained as a species of special concern in 2013. This tiny plant is 2.5-7.6 cm (1.0-3.0 in.) high and has a single pale green leaf, with up to 5 pairs of whitish kidney-shaped pinnae (lobes of the leaf). The bottom pair of pinnae are the largest and are often split into 2 unequal lobes. Each lobe will have a rounded tip and veination like the ribs of a fan, with no central midrib. Spore capsules, while typically occurring on the fertile or spore-bearing portion of the leaf, can also occasionally be found on the lobes of the non-spore-bearing portion. Botrychium pallidum commonly produces dense clusters of minute spherical gemmae at the base of the roots. These are non-sexual reproductive structures. Botrychium pallidum can be distinguished from small specimens of other Botrychium species by the often folded pinnae and pale green to whitish color (Wagner and Wagner 1993). In Minnesota, B. pallidum has been found in a diversity of habitats ranging from open fields, dry sand and gravel ridges and roadsides, to wet depressions, marshy lakeshores, and tailings basins as well as second-growth forests and shaded moist mixed deciduous-hardwood forests. It is often found growing in disturbed weedy areas and in forest areas without an overstory. This species also grows in the shade in mixed forests of Acer saccharum (sugar maple), Alnus spp. (alder), Betula spp. (birch), Picea mariana (black spruce), Populus grandidentata (big-toothed aspen), P. balsamifera (balsam poplar), P. tremuloides (quaking aspen), Quercus rubra (northern red oak), Thuja occidentalis (northern white cedar), and Tilia americana (basswood). Botrychium pallidum is often found growing with other moonwort species, especially B. matricariifolium (matricary grapefern), B. minganense (Mingan moonwort), and B. simplex (least moonwort). Gametophytes and young nonemergent sporophytes exist underground for many years (possibly 10 years) before producing their first leaf above ground. During their time underground, they presumably survive by forming an association with mycorrhizal fungi. These fungi obtain their nutrients from living trees in a symbiotic association. While it is uncertain whether the association between the fungi and B. pallidum is symbiotic or parasitic; it is likely parasitic, and it probably persists throughout the life of the plant. Although most populations contain only a few plants, there have been up to 50 individuals recorded at a single site. This is an unusually tiny plant, and its small size may cause it to be overlooked. Little is known about its habitat requirements, but it may require early or mid-successional habitats, where competition for light is minimal (USFS 2000). The primary threat to B. pallidum is the loss of habitat; however, it is unclear how suitable habitat might best be managed or maintained. The best time to search for B. pallidum is in late spring and early summer, when the leaves come out. Be aware that in some years plants do not show above the ground. Chadde, S., and G. Kudray. 2003. Conservation assessment for Pale Moonwort (Botrychium pallidum). U.S. Forest Service, Eastern Region, Milwaukee, Wisconsin. 40 pp. Dahle, R. 2000. Botrychiums. Electronic mail memo of 11 January to K. Cieminski. U.S. Forest Service. 1999. Population viability assessment in forest plan revision. Statement of purpose and reason. 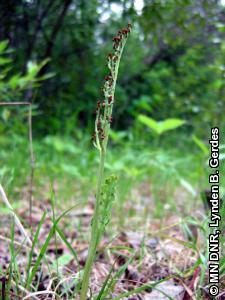 Draft species data records: Botrychium pallidum. United States Forest Service, Region 9. U.S. Forest Service. 2000. Population viability assessment in forest plan revision. Questions for plant population viability assessment panel: Botrychium pallidum. United States Forest Service, Region 9, Duluth, Minnesota. Wagner, W. H., Jr., and F. S. Wagner. 1990a. Notes on the fan-leaflet group of moonworts in North America with descriptions of two new members. American Fern Journal 80(3):73-81. Wagner, W. H., Jr., and F. S. Wagner. 1993. Botrychium. Pages 86-101 in Flora of North America Editorial Committee, editors. Flora of North America north of Mexico. Volume 2. Oxford University Press, New York.